General advise on hip arthritis and hip replacement is provided under the section Hip Replacement Recommendations. Hip Replacement surgery has been well recognised as one of the best quality of life outcomes surgery for the past 100 years. Hip replacement was pioneered by Dr John Charnley in the late 1960's and now 50 years later technology has evolved significantly that has resulted in longer lasting implants and the ability to replace younger patients hips. Studies around the world have shown that well designed and tried and tested implants should last 25-30 years or possibly even longer. The Australian National Joint Register https://aoanjrr.sahmri.com has contributed significantly to the reporting on success rates of young patients having hip replacement surgery. Dr Solomon has extensive experience ( over 20 years) in young adult and teenager hip problems that may need hip osteotomy surgery to preserve joint function or hip replacement surgery for end stage arthritis. He is well recognised as one of the leaders in his field of hip surgery. Dr Solomon has published on the results of hip replacement surgery in patients under 20 years of age (Solomon et al J Bone Joint Surg Am, 2014 Dec 17) This group of young patients often present with disabling and debilitating hip pain as an end result of major hip problems in childhood. Dr Solomon's General Summary of the younger age hip replacement (under age 55). The first important fact to understand is that in patients under the age of 55 there are a choice of bearing surfaces and in males a potential choice for a hip resurfacing replacement. I DO NOT resurface female patients due to the three times higher failure rate in females compared to males. The advantage of ceramic on ceramic bearings is that the reported wear rate is extremely low and in over 20 years of orthopaedics I am yet to see a worn out ceramic bearing. The other exceedingly rare complication with ceramic is a ceramic fracture. The material however has improved so much that the ceramic manufactures report a 0.001% rate of fracture ( 1 in a 100 000). Ceramic on highly cross-linked polyethylene is proving to be an exceptionally good bearing and the advantage of this bearing is that it does not squeak. I believe that when we have 20 year outcome data on this bearing, most replacements will use this "hard on soft" combination. There are almost 40000 primary Hip Replacements performed every year in Australia. Thirteen percent (13%) are performed in patients under the age of 55. There is a difference with respect to primary diagnosis in patients aged less than 55 years compared to older age groups. 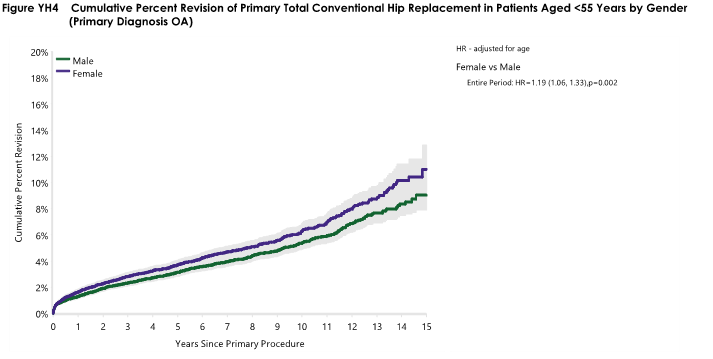 The proportion of procedures undertaken in young patients for standard primary osteoarthritis is 78.0% compared to 90.0% for those aged 55 years and older. Patients having a hip replacement for Osteoarthritis have a 7%-10% revision rate at 15 years which means OVER 93% of patients are doing well more than 15 years post surgery. 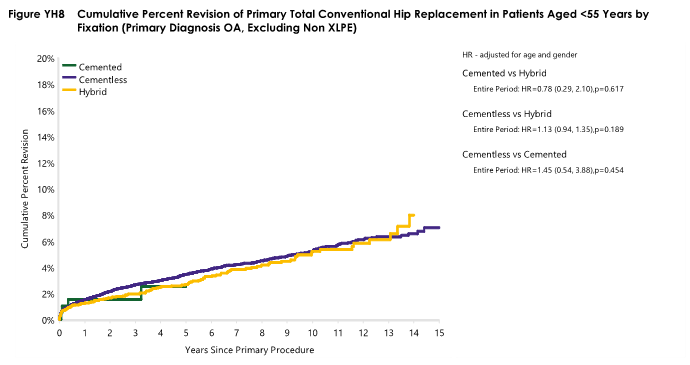 Males and Females have similar revision rates provided good implants with good track records are used. There is NO difference in revision rates for wear related problems using any of the above bearings at 15 years. The laboratory data suggests a ceramic on ceramic bearing may last longer however up to date this has not been seen in the clinical (real patient) follow up data. Ceramic on ceramic may have a 1% chance of a squeak at the extremes of hip motion and a 0.001% chance of fracture. My general philosophy is to use a ceramic on ceramic bearing in the under 60 year age group (for the theoretical advantage of lower wear) however should registry data in the future still show no difference between bearings at 20-25 years then it is likely most surgeons will use the ceramic/polythelene bearing in younger patients. Only young male patients may be suitable for this type of replacement. The advantage for the young male is that it may allow the patient to do more robust type sports like regular jogging, touch football, social soccer and generally higher impact sports. It is still a replacement and patients need to be aware that it can not behave and feel like a normal joint and rarely it may still result in complications due to metal on metal surfaces such as metal allergy, fluid build up and in rare cases soft tissue damage. Please note that the Birmingham hip resurfacing , BHR, is the gold standard of hip resurfacing implants and is NOT the same resurfacing as the ASR prosthesis made by Depuy Johnson & Johnson. The DePuy ASR was withdrawn from production over 5 years ago and that has been linked to major adverse outcomes. I have only ever used the BHR and fortunately never implanted an ASR prosthesis as I always felt the ASR design was flawed. The cumulative percent revision at 15 years for the BHR is 9.5% (males and females combined). Females had a significantly higher rate of revision. At 15 years the cumulative percent revision for females is 20% compared to 6.4% for males. Patients who have a metal on metal bearing need more regular follow up (metal ion levels and possible other investigations) to insure the replaced joint is performing properly. Hip replacement in the younger patient is very successful however it is important to understand what implants and bearings are used and how long they may last. It is equally important to appreciate that it is an artificial joint that still may wear out in a young patients lifetime and therefore the joint needs "looking after". It is still better as a young patient to walk / run or play sports on an arthritic hip that is not causing significant discomfort than to have the hip replaced. The timing of hip replacement surgery (especially in the young patient) is when you are experiencing pain requiring regular analgesics and when you are experiencing pain at rest such as night pain. It is never to late to replace the arthritic hip and you are doing no harm by delaying surgery. Most patients know "when the time is right" for surgery.